Not to be confused with the deceased British actor Bob Hoskins or the deceased American basketball player Bob Hopkins. William Hopkins (born February 2, 1942), known as Bo Hopkins, is an American actor of stage, film and television. Hopkins appeared in more than 100 film and television roles in a career of more than 40 years, including The Wild Bunch, The Bridge at Remagen, The Getaway, American Graffiti, White Lightning, Radioland Murders, Midnight Express, The Killer Elite, More American Graffiti and A Small Town in Texas. When Gretchen Corbett left the television series The Rockford Files in 1978, Hopkins replaced her character as Rockford's attorney John Cooper, ultimately appearing in 3 episodes. Bo Hopkins' first major role in a film was in White Lightning (1973), a cult classic that also starred Burt Reynolds and Ned Beatty. Bo Hopkins played Roy Boone, Gator McClusky's (played by Burt Reynolds) sidekick during much of the film. Jerry Reed played Bama McCall in the sequel to White Lightning titled Gator. Jerry Reed and Bo Hopkins bore a striking resemblance to one another, hence they played brothers Joe Hawkins and Tom Hawkins in the film What Comes Around. In 1981, Hopkins appeared in the first season of the prime time drama Dynasty as Matthew Blaisdel. His many appearances on television included miniseries such as Aspen (1977) and Beggarman, Thief (1979), and episodes of Gunsmoke, Bonanza, The Virginian, Nichols, The Rat Patrol, The Mod Squad, Hawaii Five-O, Paul Sand in Friends and Lovers, Charlie's Angels, Fantasy Island, The A-Team, Scarecrow and Mrs. King, The Fall Guy, Crazy Like a Fox, Murder, She Wrote and Doc Elliot. Hopkins has a role in the video game Nuclear Strike. He plays Colonel LeMonde, a mercenary who steals a nuclear weapon. The 'Strike' team tracks him through Southeast Asia. William Hopkins was born in Greenville, South Carolina, in 1942. At the age of nine months, he was adopted by a couple who were unable to conceive their own. Growing up, he was called "Billy." His adoptive father worked in a mill in Taylors, South Carolina. When his father was 39, he died of a heart attack on the porch of the family's home. Billy and his mother witnessed his death. Unable to remain in their house, a month later the two of them moved to a new residence in nearby Ware Shoals, where his grandfather and uncles worked in another mill. His mother eventually remarried a man whose last name was Davis. Hopkins did not get along with his new stepfather; and the two got into numerous arguments, some serious. After running away from home a few times, he was sent to live with his grandparents and while there he learned that he had been adopted because his adoptive mother could not bear children. At age 12, he met his birth mother who lived with his half-sisters and a half-brother in Lockhart, another small mill town in South Carolina. Billy led a troubled life as a youngster, with numerous instances of truancy, minor crimes, and a stay in a reform school. He dropped out of school just before his 17th birthday and joined the United States Army, where he was assigned to the 101st Airborne Division. He was based at Fort Jackson, Fort Gordon and Fort Pope, before being shipped off to Korea, where he served for nine months. After his military service, William "Billy" Hopkins began dating a girl named Norma, whom he married at about age 18, and they had a daughter named Jane. Hopkins became interested in pursuing an acting career, although his wife disapproved of it and she soon left him, taking their daughter with her. After appearing in some area plays, he received a scholarship to study acting and stage production at the Pioneer Playhouse in Kentucky, where he soon moved. While there, he began dating a girl who was a Miss Mississippi. From Kentucky, he made his way to New York City to act in more stage plays. After New York, he moved to Hollywood with his cousin's boyfriend, who wanted to be a stuntman. In Hollywood, he earned a living parking cars while studying at the Actors Studio, where one of his classmates was future Oscar winner Martin Landau. William Hopkins is my real name. Billy when I was growing up. When I went to New York, "Bus Stop" was my first off-Broadway play, and the character that I played was named "Bo." The producers wanted me to change my name, and since I wanted to keep my last name, we agreed to change the first. That's how it became "Bo." 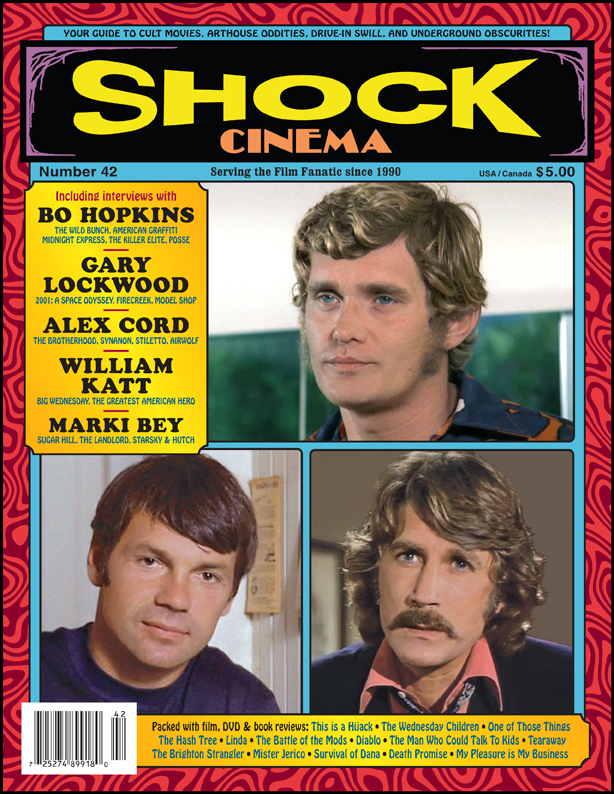 —  Bo Hopkins, Shock Cinema, "An Interview with Actor Bo Hopkins", Number 42, June 2012. Hopkins is currently married to Sian Eleanor Green (1989 to present). After six years of professional inactivity, Hopkins has returned to acting, reading scripts, and is writing his autobiography. Names You Never Remember, With Faces You Never Forget, by Justin Humphreys. BearManor Media, Albany, 2006; ISBN 1-59393-041-0. This page was last edited on 21 October 2018, at 13:06 (UTC).